The Turkish government has arrested a total of 45 co-mayors from the pro-Kurdish Democratic Regions Party (DBP) in the past couple of weeks and has seized the administration of 35 municipalities, replacing 38 Kurdish mayors in eastern Turkey. 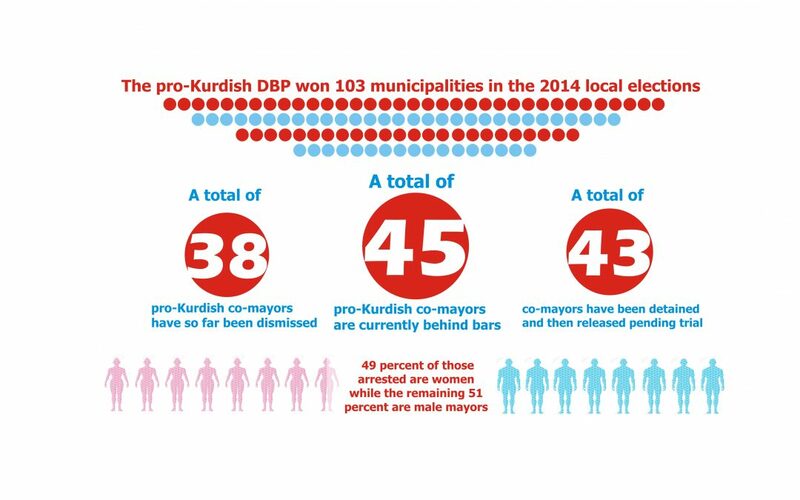 The pro-Kurdish DBP won 103 municipalities in the recent local elections, which were held on 30 March 2014, with some repeated on 1 June 2014. However, with Turkey has stepped up political pressure on Kurdish politicians in recent months, the gov’t appointed trustees to the management of 35 municipalities, arrested a total of 45 co-mayors, and a total of 10 deputies from the pro-Kurdish Peoples’ Democratic Party (HDP). In one of the most recent examples, on Dec 3, Turkish police detained the co-mayors of three districts of Turkey’s southeastern province of Hakkari as part of counterterrorism operations, officials have announced. With the detention of the mayors, there are now no democratically elected administrators left in the province, as a total of three Kurdish deputies from the Peoples’ Democratic Party (HDP) have already been in prison for weeks. The Turkish government claims that the growing number of arrests of Kurdish politicians at the national and local levels are part of the fight against terrorism. On Nov. 4, Turkish courts arrested nine HDP deputies including the party’s co-chairs, who were detained in the early hours of the same day following police raids on their homes. HDP Co-chairs Selahattin Demirtaş and Figen Yüksekdağ and deputies İdris Baluken, Leyla Birlik, Nursel Aydoğan, Selma Irmak, Ferhat Encü and Gülser Yıldırım were arrested on Nov. 4. Three days after the arrest of the nine HDP deputies, Turkish police this time detained HDP deputy Nihat Akdoğan in the southeastern province of Hakkari. Akdoğan was later arrested by a Turkish court and jailed pending trial.